I've heard so much about olive oil being the oil of choice but never really paid full attention to why and what the differences are between the types of olive oil. In the past, I chose whatever what cheapest and now, come to think of it, it's whatever Publix has for the BOBO event. I never really thought about it until I received this MomSelect Holiday Product Pak that contained a very nice bottle of California Olive Ranch Extra Virgin Olive Oil. Extra Virgin Olive Oil is top grade and the costs the most. When this type of oil is true extra virgin oil (EVOO), it cannot have any flavor defects (i.e. moldy olives which can make the oil smell musty). This oil must taste fruity and has to meet rigid standards set by the International Olive Oil Council. Within the US, unless it comes from California, you can't be certain they meet the standards since California is the only state that has legally adopted the standard that is sold in that state. Just because it may state it is Extra Virgin Olive Oil, it's not always true. Virgin Olive Oil may contain slight flavor defects and has a higher acidity level which may affect the flavor in comparison to Extra Virgin Olive Oil. Pure Olive Oil or Olive Oil has been refined to remove defects and has had a little Extra Virgin Olive Oil added to add flavor. Light Olive Oil is similar to Pure Olive Oil but is made from refined Olive Oil that gives it a lighter flavor. Note that the light is only in the flavor and does not have a reduced caloric or fat count. First Cold Press, which I have never heard of, is the first pressing of the olives done by a hydraulic press at a temperature less than 80.6 degrees. Pomace Olive Oil is obtained by mixing solvents into the olive pulp that is a byproduct of the milling process. Heating the pulp than allows additional extraction of the oil. If interested in learning more, you can join the California Olive Ranch newsletter, their blog, become a Facebook fan or follow on Twitter. How about some great recipes? Mix together the Almond Romesco Sauce and the mayonnaise until smooth. Reserve. Spread one side of each piece of bread with the Almond Romesco mayonnaise. Place half of the arugula on 2 of the bread slices and top with half of the grilled onions. Slice each chicken breast and place on top of the onions. 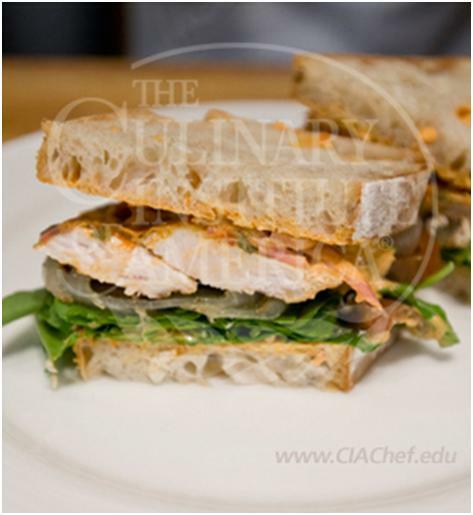 Moisten chicken breast with any remaining Almond Romesco mayonnaise. Place remaining 2 bread slices, Almond Romesco mayonnaise side down, on top of each sandwich and cut in half from corner to corner. Whatever your Olive Oil needs are, www.californiaoliveranch.com has what you need. Cook's rated California-Grown Extra Virgin Olive Oil #1. Contact me if you would like a special free shipping code. Note: I was provided one bottle of California Olive Ranch Olive Oil by MomSelect. I was not compensated any other way for this post.